we need to do something nice for ourselves. something healthy. something full of leafy greens. it is a bit of a selfish request, you see. i'm on a couch coughing my lungs up, surrounded by lozenge wrappers and half drunk cups of mint tea. i have a really divine fudgy brownie recipe, but it'll wait for later. this is not exactly a quick weeknight recipe. 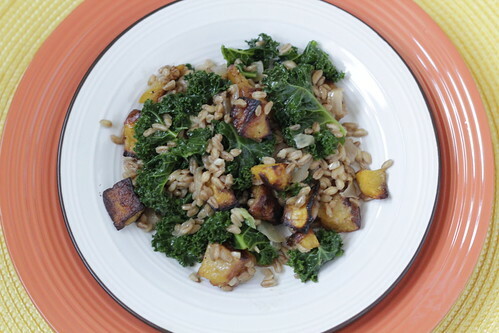 the three elements need to be cooked separately – the kale blanched, the squash roasted, and the farro is slowly simmered risotto-style. aka: lots of stirring. but when the dish comes together, it is magically greater than the sum of its delicious parts. cooking the farro slowly, first by toasting the grains and then slowly adding chicken broth, results in a deeply nutty and meaty flavor. the grains stay al dente, with a nice firm bite. but the broth reduces down to an almost creamy sauce. it perfectly coats the kale. 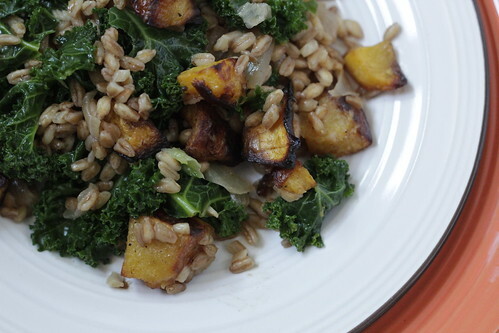 this all works because farro has the same starch as arborio rice. you get the same unctious mouth feel (how awful is that phrase!) 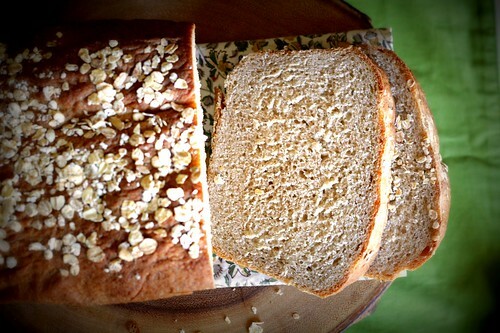 but with a bit of whole grain goodness. unless you're not into that type of thing. i think farro might be a good grain? it's ancient, which i think is good. ugh. nevermind, don't ask me. i've already got enough research projects for my cold-medicine-addled brain to manage. what i do know? try to find the pearled farro. it won't take as long to cook. plus it sounds special. i used acorn squash here, as called for by the original recipe. but i'd bet you could open one of those super handy dandy packets of pre-cubed butternut and save yourself a few minutes of cursing as the vegetable peeler is gummed up yet again with squash skin as you're fruitlessly digging it into the narrow little acorn squash furrows. does anyone know a better way to peel acorn squash? or was acorn squash really only meant to be halved, filled with butter and brown sugar and roasted? shall we leave the peeling and cubing for the slightly more ergonomically-inclined butternut squash? yes? good. glad we settled that. either way you go, this is a really lovely comfort food. hearty and satisfying without being heavy. easily made vegan if you are so inclined. but also lovely with a sprinkle of parmesan cheese for those of us who like a little indulgence. From Epicurious. Delicious as a side for a simple roasted chicken, or a main for meatless Mondays. Preheat oven to 375°F. Melt 1 tablespoon butter in a medium saucepan. Add squash, season lightly with salt and pepper, and toss to coat. Spread out on a rimmed baking sheet. Roast, turning squash every 10 minutes, until tender, 30–35 minutes. 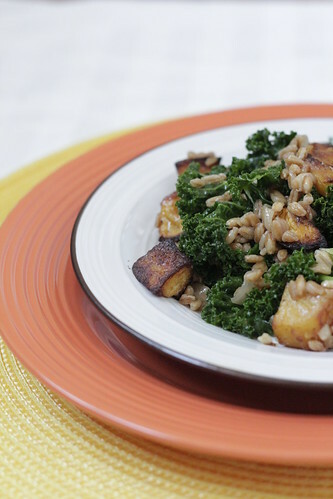 Cook kale in a large pot of boiling salted water until wilted, about 2 minutes. Transfer to a bowl of ice water to cool; drain. Heat oil in a large ovenproof skillet over medium heat. 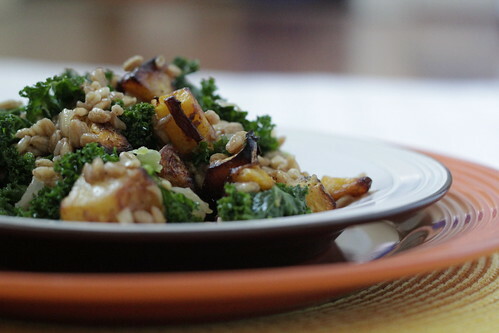 Add farro; toss to coat. Roast in oven until toasted, stirring once, about 6 minutes. Transfer to a bowl; wipe out skillet. Melt 2 tablespoons butter in same skillet over medium heat. Add onion and cook, stirring occasionally, until translucent, about 4 minutes. Add garlic; stir until aromatic, about 2 minutes. Add wine; increase heat to high. Stir until almost evaporated, about 2 minutes. Add farro and 1/2 cup warm stock mixture. Stir until almost all liquid is absorbed, about 3 minutes. Continue cooking, adding broth by 1/2 cupfuls, stirring and allowing broth to be absorbed between additions, until farro is tender. This will take between 30 and 45 minutes – maybe up to an hour. I can usually tell when it is time to add more broth when you can drag your wooden spoon across the bottom of pan and the little liquid left stays parted for a few seconds. 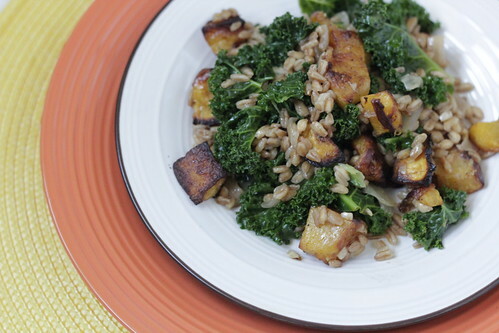 Add kale, squash; stir gently until vegetables are heated through, about 2 minutes. Season to taste with salt and pepper and a sprinkle of parmesan cheese. there was this great story on npr the other morning about the "ikea effect." conventional wisdom has generally been that people spend time on the things they love. the researchers being the ikea effect posit the thought that spending time on things is it's own active force in building that love and sense of emotional connection. the idea that the more effort you put into something, say building a slightly wonky bookcase, the more you care about that object. even if you were slightly overly aggressive with your new power drill and the screws came poking through the decorative finish. whatevs. that totally didn't happen to me last night. ps: my cooking magazines finally have a home! hurrah! i've been spending a fair amount of my time recently on fairly ridiculous diy projects. like baby quilts. there is no economy of scale to making them at home, friends, but the many many hours i've spent on them has made me pretty happy. and i hope when the new mommas see the puckers and imperfections, they love the quilt all the more for knowing it was made with love. my grandmother, as the napkin in the photo below can attest, had way better skillz than i. those are vintage, friends, and still immaculate. 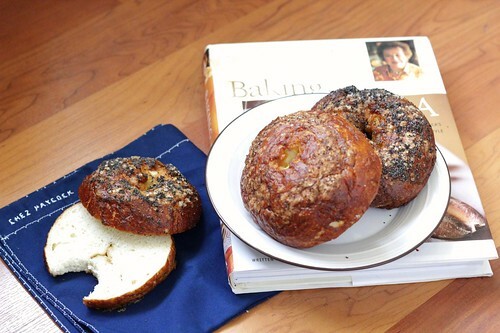 turns out, making homemade bagels is pretty akin to other ambitious diy projects. particularly if you, like me, are not overly detail oriented. there are a lot of steps, people. things get both sticky and slippery, if you can believe it. rounds of dough may go flying. 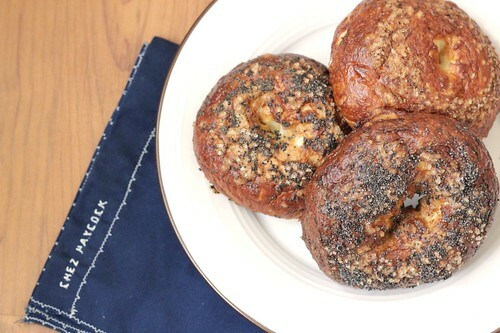 i tried to go for more of a pretzel bagel, under the somewhat shaky logic that i've previously succeeded in boil-and-bake efforts on that front. plus, i like a bagel with a nice chew, and a good firm skin. so, i added about four times the baking soda to the bagel bath. it gave them this lovely pretzel color. still can't quite tell if that helped make them look more appealing? 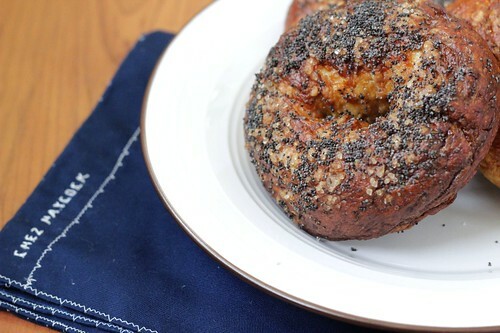 in any event, they tasted not too shabby in both the poppy seed and kosher salt varieties. slightly underbaked, the way i like them, so nice and moist in the middle even on day two. they ended up being monster sized. i froze some leftover dough that may become reasonably sized bagels for the new, lower carb manchego's kitchen of 2013.
i know. i can't believe i typed that either. more shocking? i stopped drinking coffee. back in california less than 6 months and i'm already going granola on you. i spared you photos of my blueprint juice experiement, so just be grateful. low carb or not, i'm back at the baking with julia challenge. there are muffins and brownies and all sorts of terribly wonderful things headed this way. 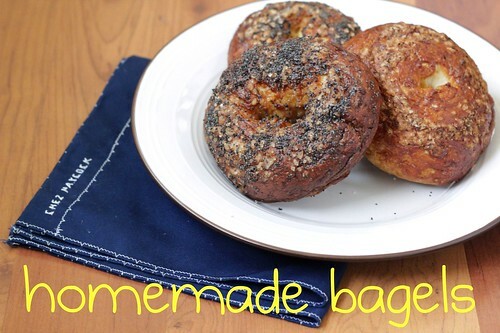 if you want to head down the bagel bunny hole, visit the tuesdays with dorie blog or heather's bytes. this fall felt so long and warm, i thought that winter would never really come to california. when the cold finally began to hit, it came as a bright surprise, a delicious reason to hunt for boot and socks and layers of long sleeves. for a mug of afternoon tea and slice of buttered toast. you look like you could use a piece of toast too. 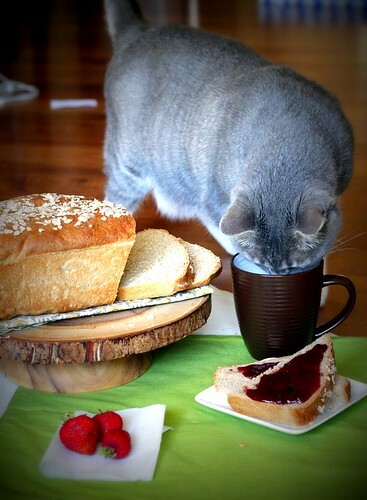 and not just any piece of toast will do to drive away the now lingering chill in the air. particularly if your work furnace, like mine, emits any number of lovely knocking sounds but not much actual heat. 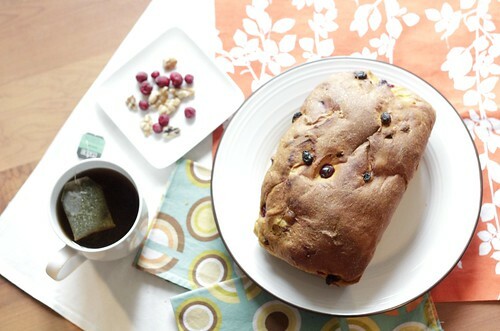 this isn't your typical pumpkin bread, dense and spicy. it's an airy yeast bread. 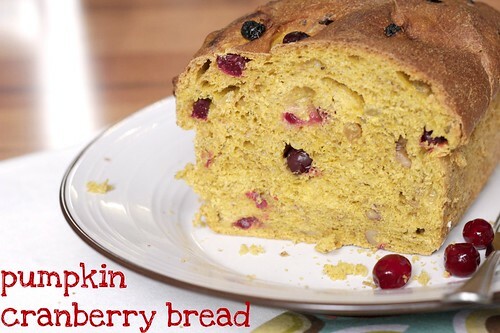 the cranberries burst in your mouth with a tart contrast to the lightly sweet, faintly pumpkin bread and crunchy toasty walnuts. this is the perfect antidote to the post-holiday season food slump, offering comfort without excess. it may not be quite as virtuous as salad with grilled chicken, but it's a far cry from a platter of christmas fudge. i am so sadly off track with tuesdays with dorie. you don't want to know how long these photos have languished in my camera. but find out by going to tuesdays with dorie or this bountiful backyard to find the recipe and lots of blog coverage. 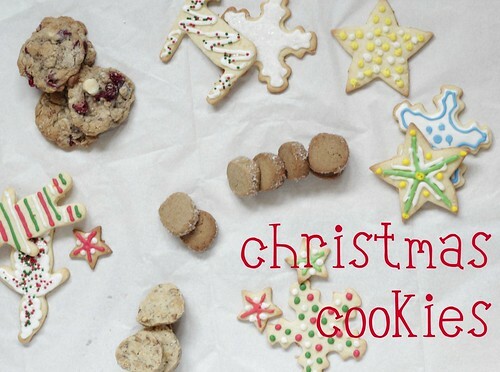 so, i made you some really adorable and yummy cookies for this holiday season. packaged them up in sweet little boxes with tissue paper and ribbons. and then proceeded to take many, many horrible photos of them. i've been struggling to get into the holiday spirit this year. too many cocktails, not enough general cheer. too many packages gone missing in the brown ups truck in the sky. my gifts for my sisters-in-law may not arrive until february, but i had a pretty solid cookie strategy. 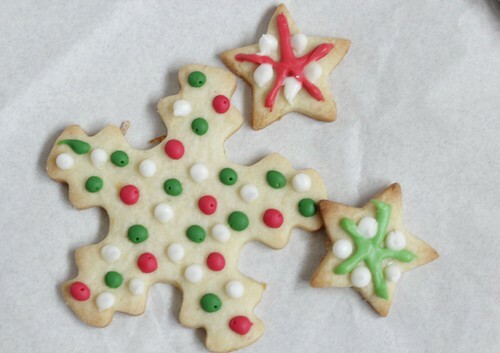 my go-to sugar cookie recipe is a cut above due to the addition of an aggressive amount of citrus zest. i upgraded my oatmeal chocolate chip recipe with some cranberries for color and tang. several of our nation's dairy farmers are having a fine christmas thanks to the brown-buttery deliciousness of rosemary walnut shortbread. and because it isn't christmas without some powdered ginger and sparkle, i added dorie greenspan's speculoos buttons into the mix, but mine aren't nearly as cute as those gracing the cover of bon appetit. extreme walnut close up. please just be grateful it isn't blurry. these shortbread cookies will melt in your mouth. did i mention the butter? they left darling little grease spots on the tissue paper. allow me to warn you about the speculoos buttons, however. it will be nearly impossible to tell when the little buggers are done since they are such a warm lovely brown color to start. so you must remain vigilant about over baking them, which will turn them into tiny spiced hockey pucks. you will lose a tooth. you have been warned. but aren't their sparkly edges nice? believe it or not, this was one of the better photos. in my next life, my kitchen will be nothing but windows. WINDOWS I SAY. for those of you who know my sommelier, you will enjoy the image of him on the couch on a saturday night, watching a dreadful movie involving horses and the end of my respect for steven spielberg, delicately frosting reindeer antlers with a squeeze tube of royal icing. 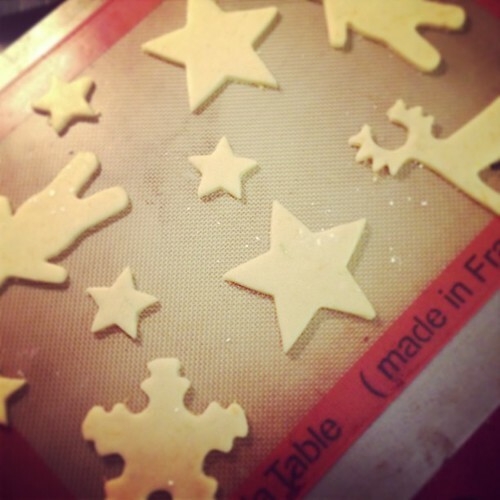 i think we generally ended up with a nice mix of frosted cookies that looked nearly professional, but just charmingly off key so as to seem legitimately homemade. towards the end of the rather nice bottle of twomey 2008 napa valley merlot, the cookies looked a lot closer to what you might expect out of a kindergartner with some fine motor skills challenges. 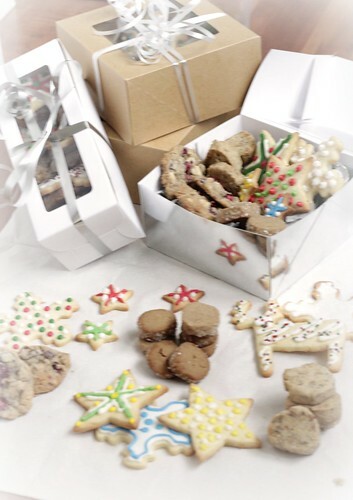 those cookies ended up at the bottom of the box. just slightly out of frame. not that you would even be able to tell much about the quality of our handiwork, based on my mad skills with a camera. so, with that, i will leave you with this gem and some links to cookies that you should revisit in march perhaps, when the gray sky and several months of pretend-dieting leave you in the need for something sweet. 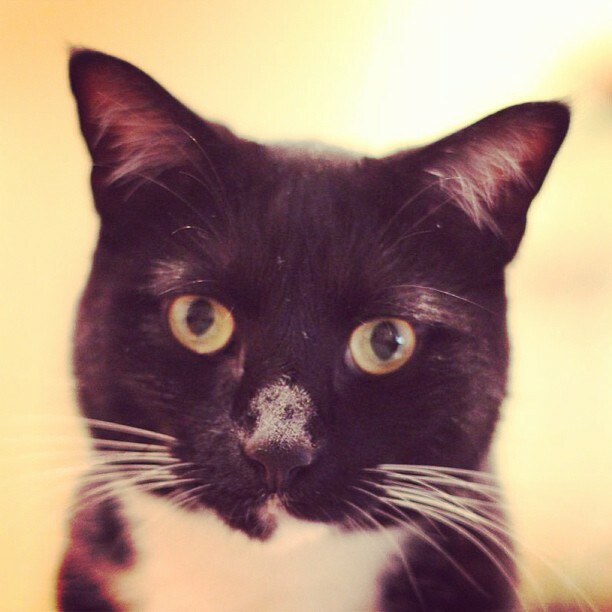 does the filter make it seem like it was supposed to be fuzzy? good. let's go with that. 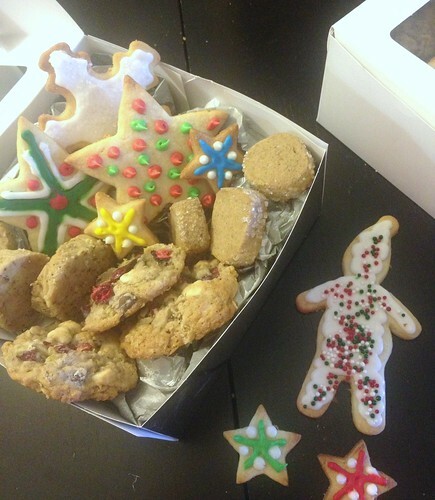 it was quite the pretentious little display of cookies anyway. cranberry oatmeal chocolate chip cookies - please note that i cut down on both butter and chocolate, as recommended by the reviewers. it felt like sacriledge, but made for a very nicely balanced, chewy cookie. 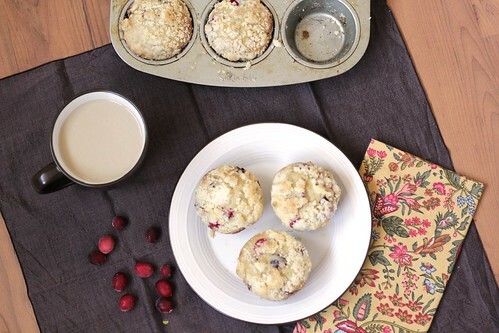 plus i used my cranberry technique from these muffins. sometimes change is hard. sometimes change is really really hard. sometimes you're the one who gets to jump off the cliff, sometimes life gives you a nudge. or a shove. finding a new favorite muffin recipe is not hard change. for close to ten years, i'd been a pretty strong proponent of a gem of a muffin recipe. really tender from sour cream, a sweet but not too sweet base that let pretty much any mix-in shine. but i've been won away. by browned butter. 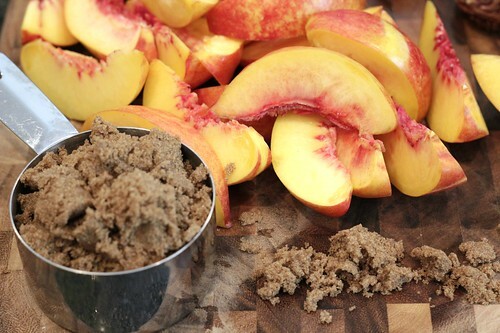 and the best crumble topping. and you know how i feel about crumble. my new muffin base is from the joy the baker cookbook. which you should buy if you love to bake. she has some real gems in there. luckily, the power of the internets will also bring you the original recipe for free, over on shutterbean. i've made the original blueberry version with much success here. but it is fall. i had some leftover cranberries. i wanted that tart burst of flavor, and a hit of wintery citrus. let's be honest, i wanted to try out a new cranberry technique from cooks illustrated. because cranberries, like change, can be hard to manage. they can be too puckery, too bitter. they need a bit of care, especially if you are using fresh berries, not to overwhelm a bite, to leave you with the right balance of tart and sweet and juicy. 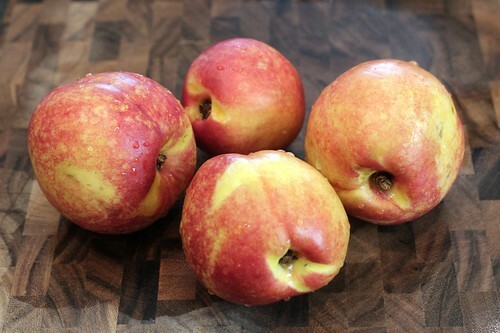 the solution is to roughly chop them and let them sit for a minute with a sprinkle of salt to draw out the bitter and a bit of powdered sugar to tame the sour. if only solving life's imbalances were so easy! 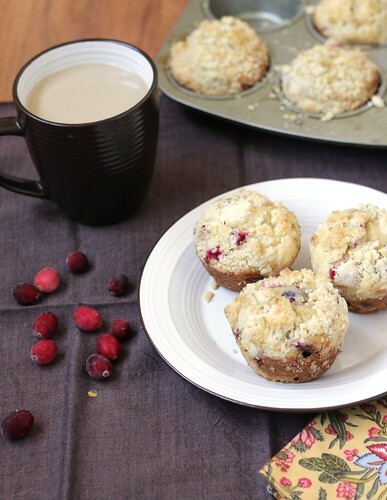 the result is a true cranberry flavor, evenly distributed through your muffin. a bit of nutty depth from the browned butter. bright orangey citrus. and that crumble. picture perfect. 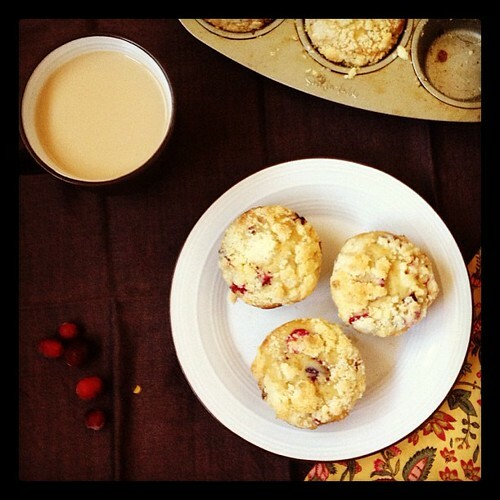 Adapted from Joy the Baker's Browned Butter Blueberry Muffins. Makes about 12 muffins. Preheat your oven to 375 degrees, and put liners into your muffin tin – this recipe will make around a dozen regular muffins. To brown the butter, melt it in a pot on the stove and then let it keep going until the white foam mostly goes away and the butter becomes a warm brown color with little black specks. Just keep a good eye on it because it will turn from brown to burned pretty quickly. 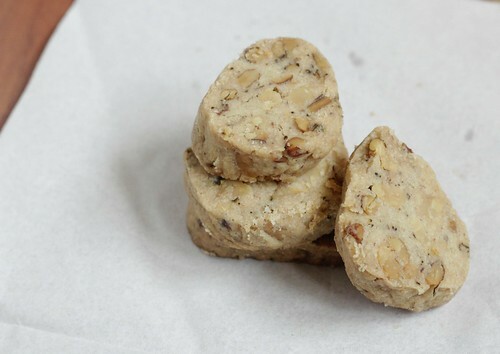 It will smell nutty and fantastic once it's done, and then you need to take it off the heat and pour into a heat-safe bowl to keep it from continuing to cook. Roughly chop your cranberries and place in a small bowl. Sprinkle with salt and powdered sugar, stir and leave to sit on counter while you get your batter together. In a medium bowl, whisk your milk, eggs and vanilla. Add the butter when it is a little cool, but hasn't hardened. Whisk to mix. In a larger bowl, whisk together the flour, sugar, baking powder and salt. Zest your orange and add that in. Add butter mixture, and gently stir just intil batter comes together. Add cranberries and fold gently to combine. Divide the batter among the muffin cups. 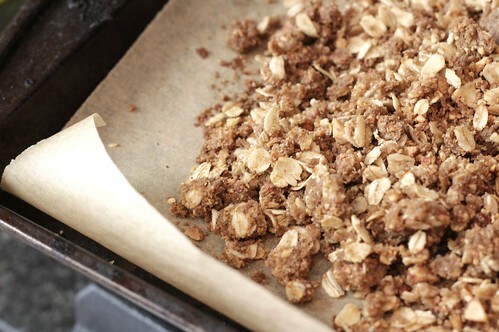 To make the crumble, combine all ingredients in a bowl and use your fingers to smush together. Don't worry about fully working butter into the dry ingredients, you want it crumbly! 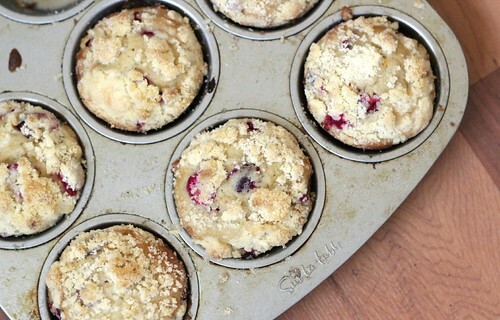 Sprinkle a healthy serving of crumble over the muffins – it makes plenty! Bake for 18-20 minutes until the edges start to turn golden and when you insert a skewer into the center, it comes out clean. Delicious warm with salted butter, but they will keep for a couple of days in a tupperware container. They're so good, you think that they'll get gobbled up. But as someone who has sat at the bottom of the cliff with that tupperware container, I know you'll thank your lucky stars. i took a few months off this year. to move. to breathe. to sleep. i learned a couple of things about myself. particularly, the importance of structure. for example. without a plan, a day can unspool, like a bobbin of thread running loose across the floor, every tug you give it just sends it further off, spinning, unwinding. without an outside force to impose structure, you have to impose your own boundaries. some i'm terrible at, like turning the tv off after enjoying a little matt lauer with my morning coffee. some i can handle, like waiting to have that first glorious glass of crisp white wine until after exercising . . . to trying to restrain myself during the week. setting your own boundaries is the real mark of adulthood, the respecting of responsibilities. when we're little, we think adulthood is nothing but eating cocoa puffs for dinner and staying up as late as you want. when you're actually an adult, you long for the self-will to eat broccoli, go to bed with a good book at 8:30.
whole wheat bread is like that for me. 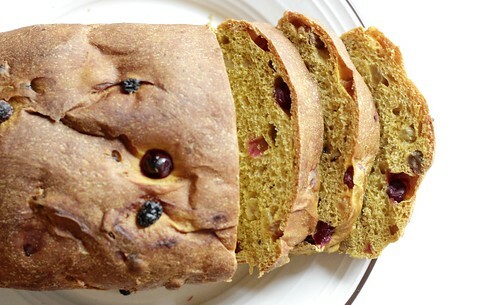 my desert island food is a loaf of chewy, crusty, fluffy-soft-centered, processed within an inch of itself, bread. 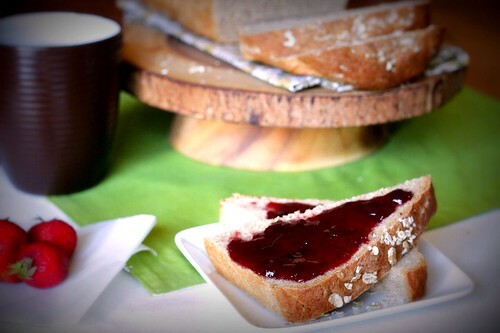 crock of butter and jar of jam appreciated, but often optional. i've found a multigrain, seedy loaf that i've enjoyed from time to time. particularly toasted with a smear of avocado, squeeze of lime, sprinkle of sea salt. but i don't crave it. 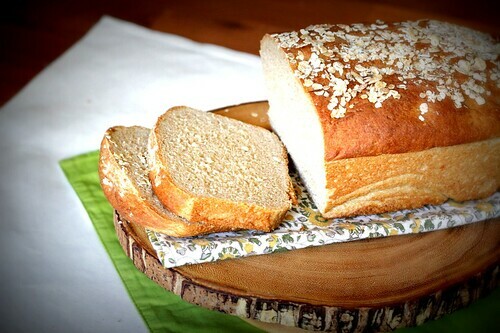 i won't eat a whole loaf in the course of an afternoon, one torn, ragged piece at a time. 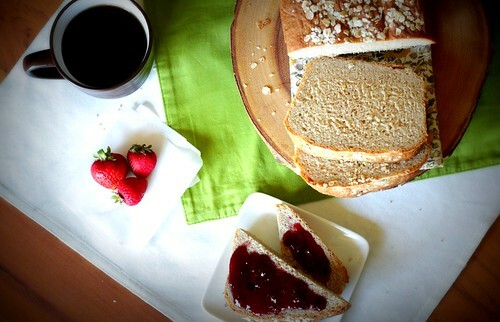 whole wheat sandwich bread is a sad stand-in for either type of carbohydrate glory. fresh, it can be seductive, soft and toothsome. but the follow-through is never there. as toast, it is mostly air. crisp and unsatisfyingly inhalable. 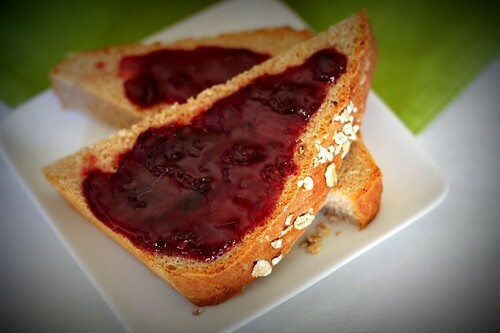 it is otherwise merely a vehicle for sandwich contents, thick layers of crunchy peanut butter with jam or crystallizing honey soaking through the bread, dripping out the sides. tart dijon, creamy mayonnaise with the firm bite of cheddar and lunch meat. homemade whole wheat comes much closer to being both adult and responsible as well as feeling indulgently out of bounds. 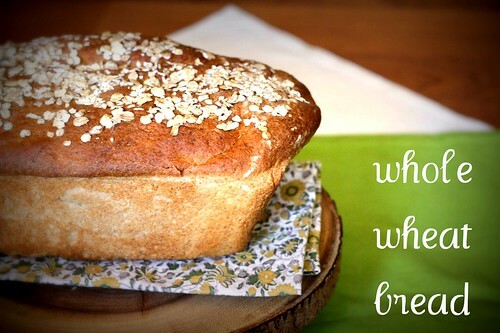 baking bread offers lovely structure to the day, with set times for kneading and rising and shaping and baking. 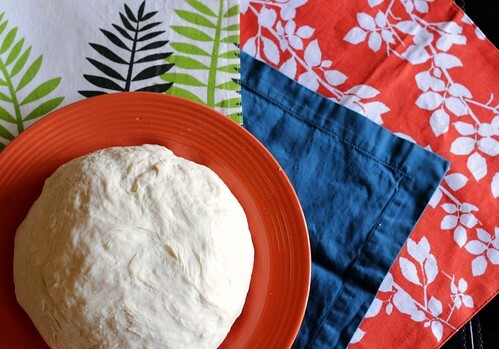 coming back to the kitchen to find your dough exploding from the bowl, streching slowly but relentlessly against the plastic wrap, now that is an accomplishment. and the day the loaf comes out of the oven, the crust is crisp and crackly, the interior light and spongy. and the next day? i'd recommend french toast, giving the slices plenty of time to soak up the egg batter, fried in plenty of butter to give you a crisp exterior and custard-soft interior. 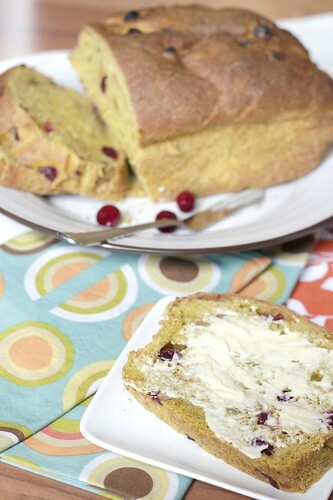 find the recipe and more great photos at tuesdays with dorie. summer is almost over. what a summer it has been. here in california, the edges of summer linger in lazy, sunny afternoons. autumn is trying to sneak in with its crisp, cool air. it is there in the cloud cover that hangs softly over the mornings, easing us into the day and the rhythm of life starting back up again. in the shortened evenings that make us start to think about cozy stews and apple crumbles. there are still heavy red tomatoes and green papery-husked ears of corn at the market, but they sit side by side with rosy apples and bright orange pumpkins. 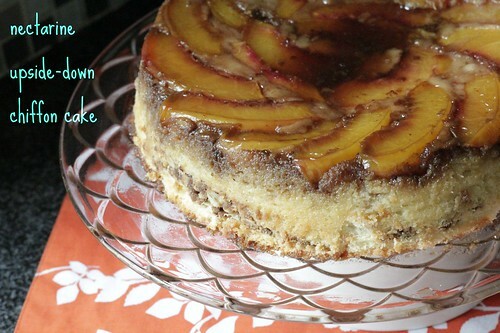 if you're lucky, there's still stone fruit as well. 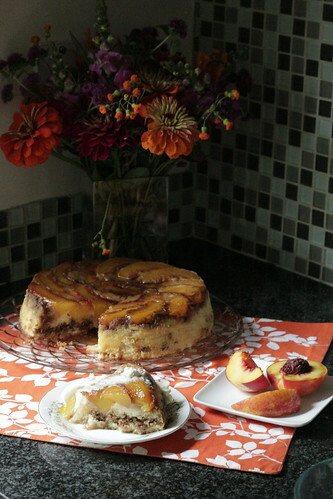 this cake nicely bridges the end of summer, with the bright, sweet acid of the nectarines and the warmth of cinnamon streusel. if summer is already a bit of a memory, apples would substitute nicely, maybe mixed together with a handful of tart cranberries. 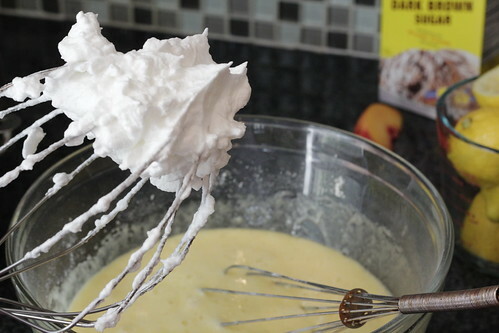 whipped cream in the batter makes the cake light. 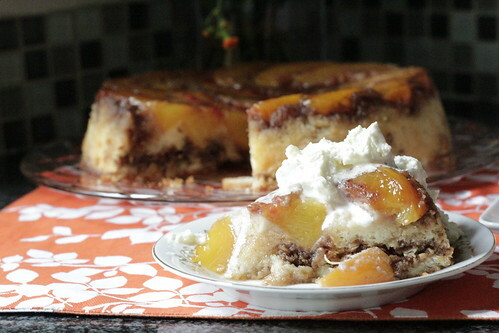 a hint of lemon keeps it from excessive sweetness with the marbled layer of cinnamon streusel inside and sticky, carameled slices of nectarine on top. this is a knock-winner of a cake. beautiful, but not fussy. perfect with a scoop of real whipped cream. you can find the recipe over at tuesdays with dorie, and at the double trouble kitchen and the little french bakery.